Our integration courses have been well known for many years thanks to their exceptional quality, highly qualified teachers and large amounts of personal attention for the student. We ensure that our students become familiar with the Dutch language and culture, so that they can confidently participate in Dutch society. These are lessons in which you are fully supervised by your teacher. There is a lot of interaction between group members and the teacher. These are individual lessons via headphones and a book. Everyone works on their own in the same room and there is a teacher who guides you, corrects your work and answers all of your questions. These are lessons which can be done both at school and at home. The first periods will be focused on all aspects of the Dutch language and culture. The period prior to the exams will be focused specifically on the upcoming exams. The integration exam and state exam both consist of the following components. The “Orientation on the Dutch Job Market” component applies only to those who have become obligated to integrate after 1 January 2015. 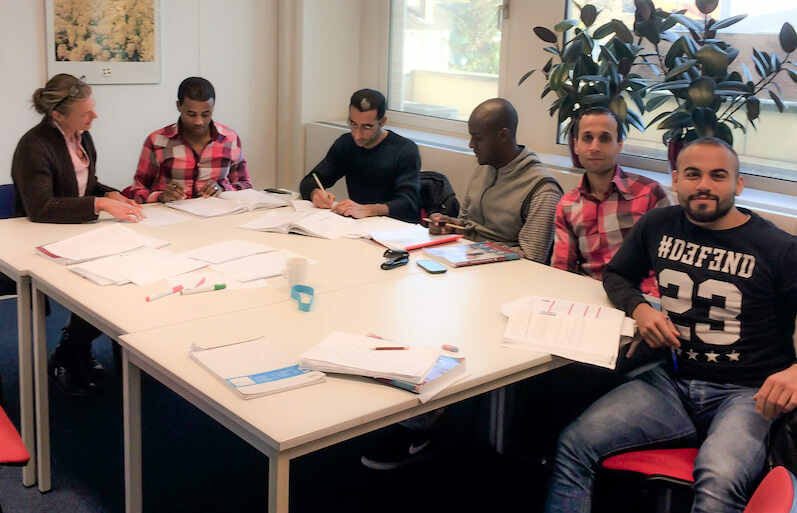 Orientation on the Dutch Job Market. This exam is about finding a job and working in the Netherlands. You will make assignments at school and at home, and you will create a portfolio. Once the portfolio has been approved, you will do an interview at DUO. During the interview, you will talk about your performance on the assignments and answer their questions. Knowledge of Dutch society. This exam will be done on the computer. By answering around 40 questions, you will show that you have sufficient knowledge of Dutch society. The exam covers themes from everyday life in the Netherlands that are taught in the classes. This exam will be done on the computer. You’ll see videos and hear conversations. These are about work, education or daily life in the Netherlands. Each video or conversation contains a number of multiple choice questions. In total, you will answer about 25 questions. This exam will also be done on the computer. You will read texts and answer about 25 multiple choice questions. The texts are about work, education or daily life in the Netherlands. This exam will be done on paper. You will get several assignments, for example, writing a letter or email or filling out a form. You will also complete sentences. In this exam you will show that you are able to speak and understand the language sufficiently. You will watch videos and give provide short answers to questions. Can I stop my course whenever I want? Yes, at Fairfield College you can stop your course whenever you want. And you will never pay for lessons that you did not receive. What's the price of an integration course? How long does an integration course take? If you are a fast learner, you can be ready within one year. If you have trouble learning the language, it may take 2-3 years. When can I start my integration course? A student can start as soon as a suitable group is available. This may be immediately, but sometimes it may take several weeks. What components does an integration course consist of? An integration course consists of group lessons, language lessons and computer lessons. The first periods will focus on all aspects of language and culture. The periode prior to the exams will focus specifically on the upcoming exams. How many lessons per week will I get? Most groups will get 3 lessons of 2 hours per week. Students can choose to supplement these classes with language and computer lessons. This way, each student can decide how much time he/she will spend practising the language. On average, students attend school 9 hours a week. In what kind of group will I be placed? We will look for the group that suits you best, depending on your country of origin, your level of education, your knowledge of Dutch language and your age. You can indicate your wishes yourself. We strive to form groups of 4-8 people. Can I switch to another group? This is possible, provided that there is a suitable group available. If there isn’t, then you may have to wait until a new group is formed. In the meantime, you can follow language lab or computer lessons. What is I'm not satisfied with the group I was placed in, or if the times do not suit me? In that case we will do our best to find another group that is more suitable for you. If there isn’t a suitable group immediately available, then you may have to wait until a new group is formed. In the meantime you can follow language lab or computer lessons. When can I take an exam? You can take an exam when you score consistently well on the practice exams. If I do not have a loan, can I pay for my lessons in instalments? There are several payment structures possible. It is possible to pay per month afterwards. The number of lessons that month will be added and charged. However, other arrangements are also possible. Everything is negotiable. Can I participate as a beginner, even if I do not speak English? Yes. The teachers are used to teaching novice foreigners without using English. We encourage everyone to use as much Dutch as possible.